The Hawksworth Young Chef Scholarship Final judges at Hawksworth Restaurant. From left: this year’s scholarship winner Michael Christiansen, Scott Jaeger, Michel Jacob, Kristian Eligh, David Hawksworth, Normand Laprise, Anthony Walsh. Chef Michael Christiansen chopping salsify, which he later used in a purée. 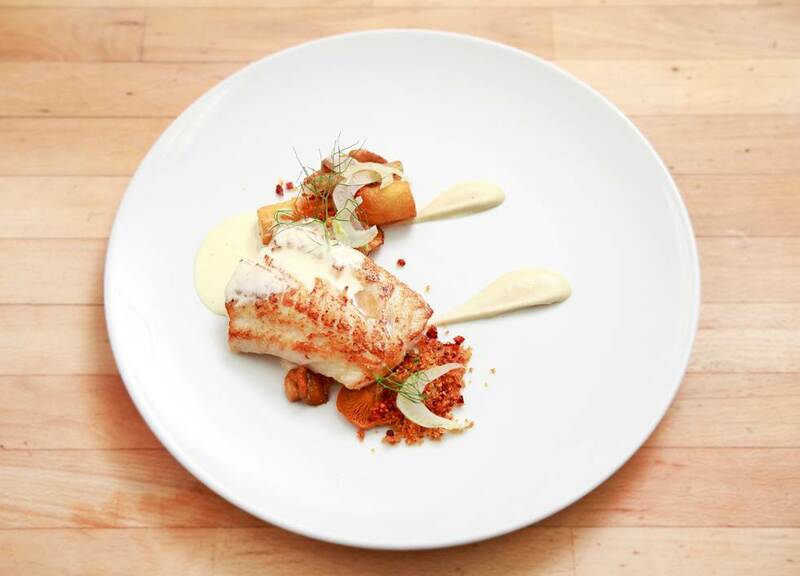 Chef Michael Christiansen’s winning dish: grilled ling cod, salsify puree, chanterelle mushrooms, and heart of palm. 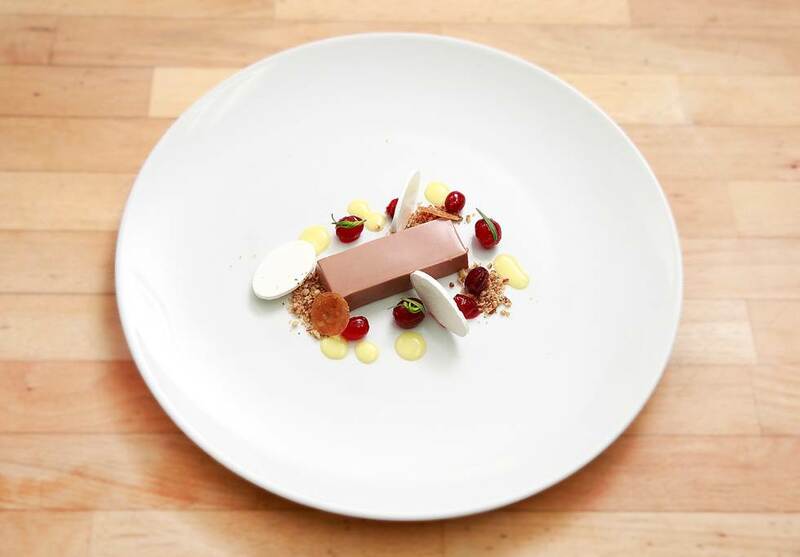 Chef Michael Christiansen’s winning dessert: Valrhona chocolate panna cotta, poached cranberry, and pecan streusel. 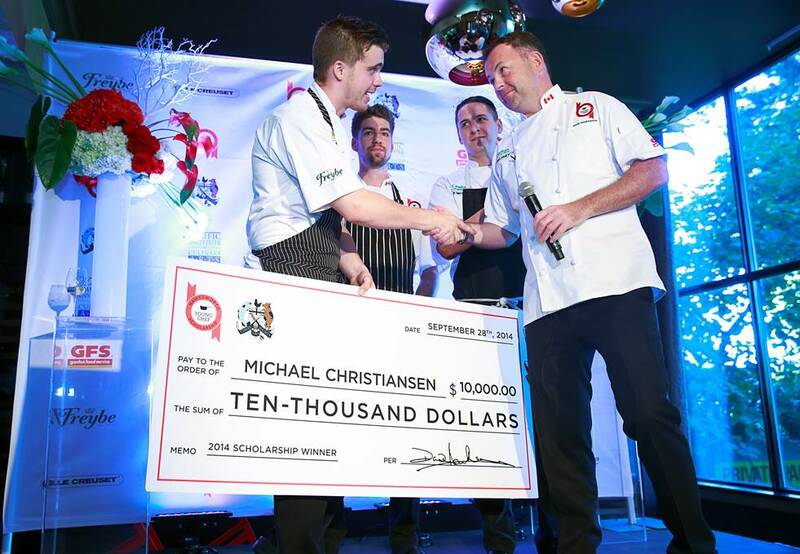 Chef David Hawksworth awarding chef Michael Christiansen the 2014 Hawksworth Young Chef Scholarship. If the art of plating a dish didn’t already have its own set of challenges, certainly performing under a ticking clock in a room full of observers adds to that pressure. This past weekend at the Pacific Institute of Culinary Arts (PICA) on Granville Island in Vancouver, British Columbia, eight of the country’s brightest up-and-comers did just that. 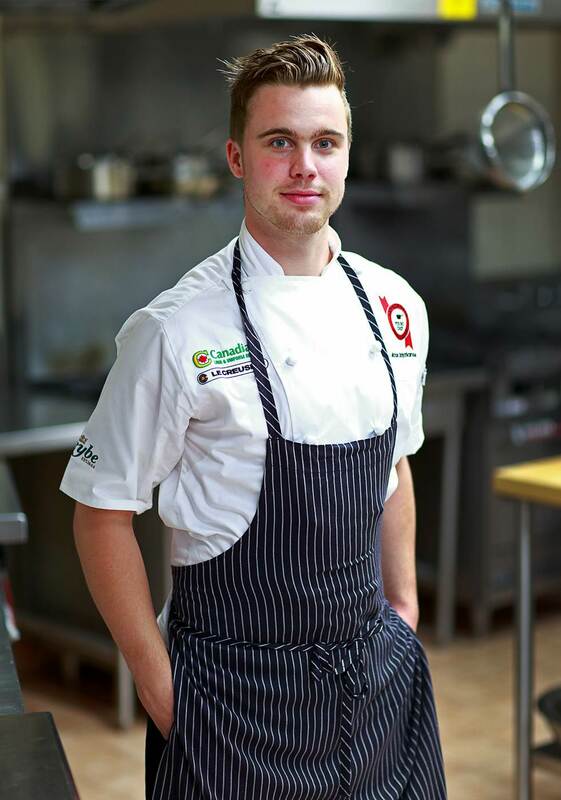 This is just the beginning, not only for this young chef, but also for the growing program. 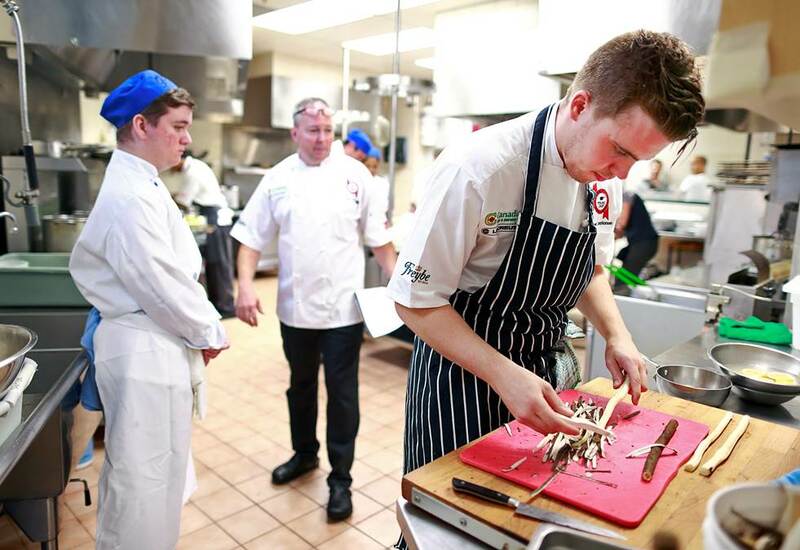 “[The scholarship is] really doing something for the industry,” Hawksworth says. 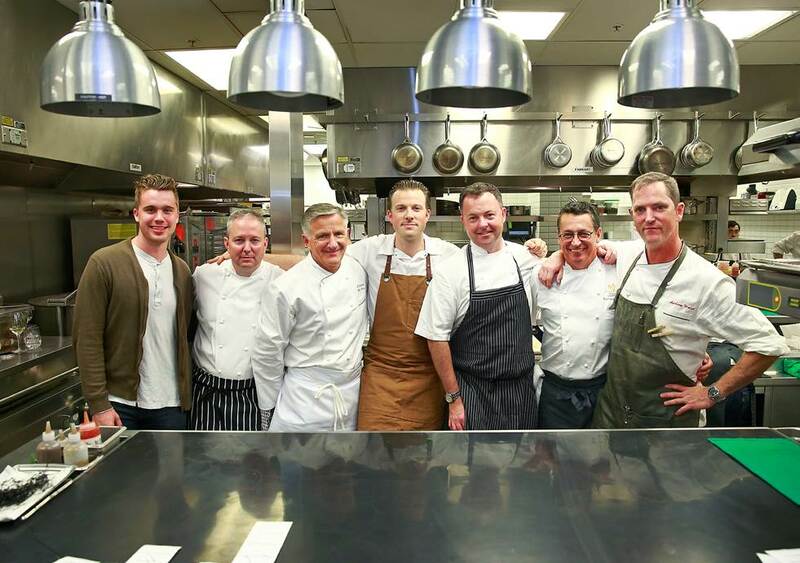 “I’d like to see Canadian restaurants really get on the map on a global scale.” This task is well on its way with Hawksworth and his team hoping to advance the program with the inclusion of additional heats in cities such as Montreal and the Atlantic provinces. Through their tireless efforts, the scholarship program, even in its infant years, is serving as a national platform and ushering in the next generation of Canadian culinary talent. Photos courtesy of the Hawksworth Young Chef Scholarship.